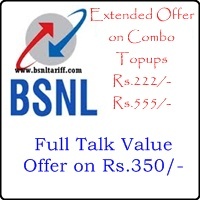 Telecom backbone Bharat Sanchar Nigam Limited (BSNL) has announced Full Talk Value offer which is equal to MRP and Extended offer on Combo Topup Vouchers under Prepaid Mobile Services for limited period under promotional basis. Full Talk Value offer on denomination Rs.350/- which is equal to MRP. Extended scheme on Combo Topup Voucher of Rs.222/- offers, Free On-net calls 110 Minutes to be utilized within 40 days. Extended scheme on Combo Topup Voucher of Rs.555/- offers, Free On-net calls 280 Minutes to be utilized within 90 days. Full talk value offer and Extended scheme on Combo Topups will be implemented and with effect from 11-07-2013 to 31-07-2013.